The April 15 town hall was a win-win for Sanders and for the cable news network — both from an intellectual and a strategic perspective. How do you get a Fox News audience to enthusiastically cheer for "Medicare For All?" If you’re Bernie Sanders, the answer is simple — go there. Sanders stepped onto the cable channel for a town hall on Monday and worlds, for a moment, collided. More importantly, though, everyone walked away just fine. During his recent media tour earlier this year, Twitter CEO Jack Dorsey talked to podcast host and Ringer CEO Bill Simmons about how the platform can leave many users with “filter bubbles and echo chambers.” Said Dorsey, "If you follow only the perspectives you want to hear, it constantly emboldens your own view." We exercise physically — put our body through physical discomfort, so we can better ourselves physically. In that same way, intellectual exercise, through intellectual discomfort, can lead to bettering ourselves intellectually. The April 15 event was a win-win for Sanders and for the cable news network — both from an intellectual and a strategic perspective. This is what happened on Monday, when Sen. Bernie Sanders became the first Democratic presidential candidate this election cycle to participate in a town hall on Fox News. The April 15 event was a win-win for Sanders and for the cable news network — both from an intellectual and a strategic perspective. 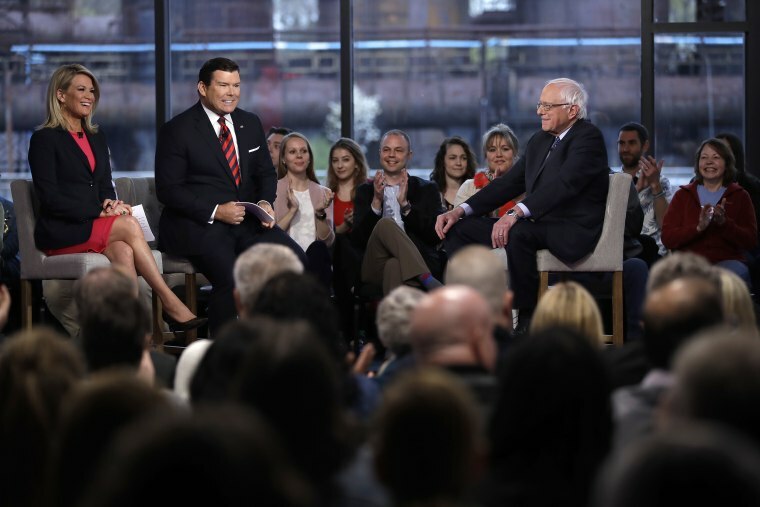 For Sanders, the intellectual exercise of fielding questions from Fox anchors Bret Baier and Martha MacCallum — in exchanges which were both fair and occasionally combative — allowed him to craft his policy positions in a more challenging environment. Healthy, nuanced debate is important, and a great test for a candidate who, if he succeeds in the primary, will have a far more unwieldy sparring partner in the general election. So — who watches Fox News? While it’s true that Fox News over-indexes as a go-to media outlet for Republicans, there are certainly Democrats and Independents tuning in as well. According to a 2017 Pew survey, while 43 percent of Fox News’ audience identify as conservative or lean Republican, 10 percent identify as liberal or lean Democrat. A 2018 Suffolk University poll found that while 67 percent of respondents said they were Republicans, that left one in three that leaned Independent or Democratic. And these are big numbers. Yes, Fox News averaged 1.4 million viewers in its total day numbers during the first quarter of 2019 — but this is just based on Nielsen’s data, and as I’ve written before, the actual number of cumulative viewers is significantly higher. That means the town hall was seen by millions of voters Sanders had the chance to appeal to. And appeal to them he did, as evidenced by this viral moment when Bret Baier asked the audience how many people would be willing to switch to a health care system more inline with Sanders' Medicare For All proposal. The response was clear. For once, Fox News viewers weren't hearing about Sanders’ positions from a primetime host or a three-minute segment; they were hearing about his positions from him, unfiltered. And they may have bristled at what they heard. But that sort of healthy intellectual discomfort is far too rare on both traditional and social media platforms. Sanders may not have convinced many, but exposure to different perspectives breeds tolerance. They may have bristled at what they heard. But that sort of healthy intellectual discomfort is far too rare on both traditional and social media platforms. We are at a moment — on Twitter and other platforms — where more voices than ever before have access to other voices across the spectrum. Yet we also see an urge to avoid voices that make us uncomfortable. This perspective is embodied by, for example, Kara Swisher of Recode asking the CEO of YouTube whether conservative host Ben Shapiro’s videos could be banned, after she discovered her 13-year-old was a viewer of Shapiro’s. Former President Barack Obama’s Attorney General Eric Holder went Bill Maher’s HBO show shortly after the 2016 election and urged the host to “ban” Republican Rep. Darrell Issa because “we have to push our side.” (Maher rightfully pushed back.) Media Matters’ CEO Angelo Carusone pushed a full boycott of Fox News after the Sanders’ town hall news broke. 2019 has had its first electric political moment, and it was Bernie Sanders on Fox. With nearly 20 Democratic candidates running for president this election, every vote matters. Democratic candidates who shun Fox News, or any other venue that may be less than fully comfortable, are making both a strategic and an intellectual mistake. Pete Buttigieg knows this — he was on "Fox News Sunday" in March. Andrew Yang knows this — he sat down with Ben Shapiro last week for an hour-long interview. These candidates are treating the brain like a muscle and exercising it. Hopefully the audience for these conservative, alternative venues are doing the same. The DNC made the call in March to spurn Fox News as a venue for all debates during the primary, so it is incumbent on the candidates to make the call on their own. Sanders’ town hall on Fox News was a victory for healthy, intellectual discomfort. And everyone should leave the exchange of ideas better — more tolerant of alternative perspectives, more challenged in their own beliefs. In a long campaign cycle, there is more than enough time for nuance. Steve Krakauer spent 10 years as a journalist and media executive, at organizations like CNN and TheBlaze. He now resides in Dallas, Texas, and writes on the intersection of media, culture and technology.